Early 2005 Mac mini: No Leopard for You! "This simple truth is dawning: If we forget about computer-industry network effects and monopolistic business practices, if we forget Apple's various ancient missteps - if we're going just by what's better - the ages-old Mac-vs.-PC debate is over. Long over. Yell it from the rooftops: The Mac has won. "And yet, you're not buying an Apple computer. Most of the world isn't. There is probably a single overwhelming reason you're clinging to Windows. Macs are expensive. This is what you've been told, and in your research, it's seemed to check out. "The present article is an attempt to prove to you that, on price alone, the Mac is not the BMW of computers. It is the Ford of computers. I am not arguing that the Mac is cheaper only if you consider the psychic benefits conferred by its quality. Rather I'm going to illustrate something more straightforward: Even though you may pay a slight premium at the cash register for a Mac over a comparable Windows PC (a premium that gets slighter all the time), it will cost you less money - real, honest-to-goodness American dollars - to own that Mac than to own that PC." "This story caps off a truly comprehensive wave of Mac OS X 10.5 Leopard coverage from Computerworld. Our readers have asked for more operating system coverage, and we're delivering. "Throughout the four years of the Vista development process, I tested and evaluated at least 15 different alphas and betas of the operating system, spending hundreds of hours evaluating the late prereleases and the final editions. Likewise, I spent countless hours testing Leopard, both in prerelease form and the final version now available to the public. What I found after all that testing is that despite their similarities on paper, Leopard and Vista are nothing alike. "There's really no contest. Tiger is a better OS than Vista, and there are no long-term downsides to Leopard. Vista doesn't measure up...."
"Now that an Intel-based Mac is a dead x86 PC, how do you bide your time until the replacement comes in?I always do my best to turn misfortune into opportunities for enlightenment, and oh, what enlightenment the past couple of weeks has placed within my grasp. When the MacBook Pro loaned to me by Apple slipped into a coma during a full-volume image backup and subsequently died in my arms, I was forced to deal head-on with the impact of Apple's switch in suppliers and with an irrecoverable loss of data and productivity - a hardship I've never faced in five years with Macs. I lost a full month's worth of work, research, and creative projects, along with every application that requires registration keys and online activation. I can barely conceal my glee at having so grand an opportunity as this to learn a new way. "I'll be pilloried for this comment, but this wouldn't happen to a PowerPC Mac. You see, there was no reference design for a PowerPC notebook. Apple had to do all its own cooking, and that included the creation of an independent system management controller. It took a mummy's curse to put a PowerPC Mac in a fully unrecoverable state. A Mac's firmware could boot into several recovery states, ranging from Target Disk Mode to a firmware boot prompt, even when a Mac would not boot. It was Apple's home-brewed system management controller that gave Mac folk legitimate bragging rights with regard to reliability; you had to do something truly nasty to kill a PowerPC Mac. "In contrast, the only way that an x86 PC, Apple's or anyone else's, can match the PowerPC Mac's resiliency is if it has a dedicated Baseboard Management Controller, which only higher-end PC servers, including Apple's Xserve, have. Otherwise, the only thing a PC does in firmware is initialize buses and catalog devices. Then it hands control to the CPU, which pulls a boot block from storage or the LAN. Intel's Extensible Firmware Interface (EFI) is tidier than the old PC BIOS, but it steps out of the boot process at the same point that a PC BIOS does. A PC that can't boot is dead. A PowerPC Mac that wouldn't boot was a diagnostic challenge...."
"I've used a lot of operating systems starting with the late, great TOPS-20 on DEC's 36-bit DECsystems. Also VMS, RSTS, CP/M, MS-DOS, Windows versions 3.1 to XP, Solaris and Mac OS versions 6 to 10.5 Leopard. "My definition of a great OS is one that makes it easy to get work done. It is consistent, intuitive and flexible. It gets out of your way when you know what you want to do. And it is stable. "However, the upgrade from 10.4.10 to 10.5.0 hasn't been as clean as I'd like. It has cost me hours of work time. I'm lucky because my work has to do with computers, I have some very smart, Mac-savvy friends and over 25 years of hard won experience figuring out workarounds. "In short, I'm not a Mac user who just uses their Mac as a computing appliance. I'm very interested in the how and what of my Mac. I like playing with my computer. But I also know lots of busy people who don't have time to mess around. And to those people I say 'Wait for 10.5.1 to upgrade!'" "Moving quickly to address issues in the inaugural version of its Leopard operating system, Apple on Wednesday tapped its developer community to begin testing the first maintenance and bug fix update to the software, labeled Mac OS X 10.5.1. "The Cupertino-based Mac maker initiated the testing process by offering software developers access to Mac OS X 10.5.1 build 9B13, which weighed in at a hefty 267MB, according to people familiar with the process. "Among the fixes already baked into the first test build are corrections to Leopard's application Firewall, Spotlight indexing, iCal syncing, Keychain login and text drawing corruption." "If you bought a new G4 Mac mini before July 26, 2005 with the base configuration and you are looking to upgrade to Leopard, we have some bad news for you. You can't. You see these machines only came with 256MB of warranty-voiding non upgradable RAM. "Get a putty knife and 3rd part memory upgrade (1Gb whynot?) then upgrade. "Start the mini it in Firewire Target disk mode and upgrade it from a newer Mac. It runs slow but ok."
Link: 2 and 1/3 years old Mac mini. No Leopard for you! Whether you are creating content for delivery on cell phones, broadcast or the Internet, or a software developer looking to take your application to the next level, QuickTime provides the most comprehensive platform in the industry. For detailed information on the security content of this update, see Apple security updates. For further information on this Update, see About iMac Software Update 1.2.1 for Tiger. To complete the firmware update process, please follow the instructions in the updater application (/Applications/Utilities/Hard Drive Update 1.0.app). The updater will launch automatically when the Installer closes. Apple's Middle-East distributor has released a free download of the Arabic localization of Mac OS X 10.4.10 Tiger. 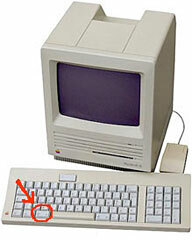 It's time to embrace the big bulky Apple keyboards of the 80's and 90's. Wear your vintage Apple keyboard pin as an ode to the most bulky, detached keyboards our friends at Apple ever produced. Rescued from a life in the e-waste pile at our local landfill, these mud-covered keys have been transformed into Mac-Pride pins for wearers to show their religion wherever they deem fit. PR: Peachpit has announced the launch of new titles designed to enable readers to get the most out of the powerful features of Leopard, Apple's latest Mac operating system upgrade. The new books are aimed at all levels of users and cover all that's new in the OS, including Time Machine, Spaces, and Quick Look. Mac OS X 10.5 Leopard: Visual QuickStart Guide by Maria Langer (ISBN-10: 0-321-49600-0), the visual guide to Leopard's groundbreaking capabilities. With hundreds of screenshots to clearly illustrate step-by-step techniques, this guide is a great reference to the essentials of Mac OS X Leopard, including new and revamped applications. Download Chapter 7 for free now at http://www.peachpit.com/leopard. Mac OS X 10.5 Leopard: Peachpit Learning Series by Robin Williams (ISBN-10: 0-321-50263-9), an essential training book for getting started with Leopard and capitalizing on all the new features. This book allows readers to learn in their own way - whether it's working through the lessons start to finish, jumping straight to step-by-step exercises about new features, or looking up just what they need to know at that moment. The Little Mac Book, Leopard Edition by Robin Williams (ISBN-10: 0-321-50941-2) adopts a back-to-basics approach to introduce users to Leopard. In a gentle, friendly style, this Mac community classic shows readers how to dive in and start working with the Mac and OS X Leopard. Automator for Mac OS X 10.5 Leopard: Visual QuickStart Guide by Ben Waldie (ISBN-10: 0-321-53935-4) uses a combination of task-based instruction and strong visuals to teach intermediate Mac users how to automate repetitive, time-consuming tasks with the Automator application that is included with Mac OS X 10.5 Leopard. For Leopard users who can't wait for the printed book, Automator for Mac OS X 10.5 Leopard will be available as a Rough Cut through Safari Books Online beginning November 2, 2007. While the book is in progress, users can choose to purchase electronic access with unlimited viewing and PDF downloads of each revision, pre-purchase the print book, or get the best of both worlds - electronic access immediately and the printbook later. Free trials of Safari Books Online are available now. Visit peachpit.com/leopard for detailed descriptions, pricing, availability, sample chapters, and articles, including "How to Get the Most Out of Leopard's Spaces," by Ryan Faas, "Top Ten Leopard Features That Will Change How You Use Your Mac," by Maria Langer and "Robin Williams's Guide to the Most Overlooked New Leopard Features," by Robin Williams. Dashboard KickStart is not a widget. With Dashboard KickStart, you'll always have the Dashboard ready to use the first time you want. Without it you'll have to wait for a complete Dashboard start-up sequence as soon as you are ready to use it for a first time, making its quick accessibility rather useless. This application can only fullfil its purpose when it opens at login, it will ask you to allow it as a login item the first time you start it up. Within moments after startup, Dock restart or awake from sleep, the application will quickly open and dismiss the dashboard, allowing all of your widgets to initiate their start-up sequence. When you are ready to use them, only minimal initialisation time will remain. Added Leopard Compatibility, please note that the previous 'Dashboard effect' has been extended with a quick 'Exposé effect' in order to make it work in OS X 10.5 Leopard. Graphics updated for Mac OS X 10.5 Leopard. Under Leopard the settings window will no longer display the number of widgets currently active.